The Cuban Missile Crisis was one of the defining events of my generation’s childhood. On October 15, 1962, US spy-plane photos revealed installation of medium range Soviet nuclear missiles in Cuba. President Kennedy ordered a naval blockade of the island – something very close to an act of war – and announced that any missile launched by Cuba would be regarded as an attack by the Soviet Union and would trigger full retaliation. The world stood closer to the brink than it has before or after. In grade schools all over the country, we had almost daily hydrogen bomb drills. I was in the 5th or 6th grade, and there wasn’t one of my classmates who did not fully comprehend the absurdity of the exercise – be sure to cover your head with your hands in the event of a thermo-nuclear blast. There was a lot of gallows humor. The guy on the corner who dug a fallout shelter was branded a “f**king moron,” by the guy in our crowd who knew more exotic words than the rest. I had already formulated my plan. The papers said we’d have 20 minutes from the time the sirens went off until the first missiles struck. I had timed myself, and knew I could run home in 8-10 minutes. When the real alarm went off, I was going to bolt so I could die with my family and my dog. I found additional consolation in an unlikely place. I had a powerful transistor radio I would listen to under the covers. Sometimes I could tune in a fundamentalist preacher in Bakersfield. One night, quoting scripture to prove his point, he assured everyone that God had promised not to destroy humanity with a nuclear war. I don’t remember his logic, but I do remember sleeping like a baby that night. All this came to mind while reading of west coast fears of radiation from Japan. I found myself wishing that preacher was still around. I found myself also recalling my parents’ generation. Maybe because the second world war was so close for them, they never pretended death was something you could avoid if you just managed things well enough. Another thing that helped was all the scientific information that was published during the missile crisis. Rather than seeming grisly, it was a comfort to know precisely what we’d be dealing with 10 or 20 or 50 miles from the blast. Among other things, I learned that there wasn’t even the ghost of a chance that that kind of radiation could travel across an ocean. Still, lack of credible information on what, precisely, we are dealing with, is sorely lacking now; critics of the government are right about that. I was recalling something else I got from that preacher in Bakersfield – something I later heard other preachers confirm – that the most often repeated phrase in the New Testament is, “Fear not.” Same thing in eastern religions; there is a hand gesture you see in pictures of Hindu and Tibetan deities that means, “Fear not.” It looks like the Vulcan salute, (“Live long and prosper”). It’s hard not to fear in the face of a scary unknown. 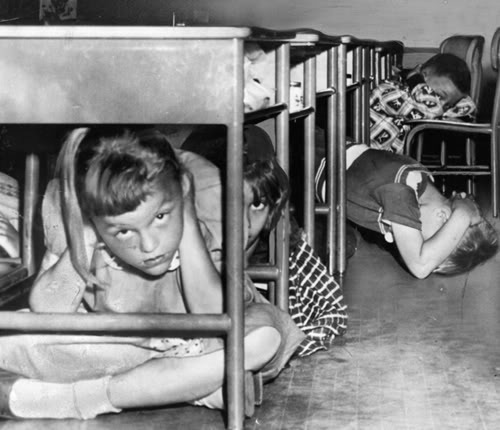 The tactics we used to cope when they ordered us to “duck and cover” under our desks won’t work anymore. Still, when you listen to heroes they all seem to say the same thing: they are “nobody special,” but at the critical moment, they were thinking of someone other than themselves and trying to do what they could. That, in a seemingly small way – that maybe is a big way after all – is available to all of us. We can give a few dollars and say a prayer for those who are suffering. Feel free to click on the Red Cross link in the right column of this page or go to the organization of your choice. It’s a far better use of money than buying Iodide pills. This entry was posted in Current Events and tagged current events, history, Science. Bookmark the permalink. I used to teach Alas, Babylon, Lord of the Flies, and Fahrenheit 451 — all books set with a background of nuclear war. I would tell the students that when those books were written (and when I was very young), most of us didn’t believe we would live to adulthood because of the threat of nuclear war. Some of my friends had bomb shelters in their back yards. We talked about building one, but never did. We had drills and learned the ways we would die from radiation poisoning. How frightening it must be for those in and near Japan with their memories of the bombings. Hopefully someday soon this sort of thing will be the kind of memory for this generation that a bomb shelter is for me. That is quite a story. I can’t imagine what it would be like to live with the constant fear of a nuclear attack. With the way things are going in the world I hope we don’t have to build bomb shelters and go through those drills again soon. I am a history buff but know little about recent history. Thanks for sharing your personal experience. I grew up in the time of Reagan’s Star Wars, much too late for Duck & Cover, but I had heard of it so when it came on TCM late one Saturday night, I watched and was terrified for all the children who watched it when it was a real time, pertinent PSA. I couldn’t imagine how afraid they must have been; you’re desire to run home to die with your family and dog is exactly what I imagined running through the heads of those children as they huddled under desks or against walls. The 80s, despite the build-ups and rhetoric from politicians doesn’t compare to the decade of Duck & Cover and I remember thinking, “No one is actually going to push the button”, it seems no one had to.